I refer to our Cambodia trip as epic because it is only one of two trips I have taken in the last twelve years that has been extended from my normal weekend trips to an entire week in length. The other was to Turkey to see the total solar eclipse from the Aegean Sea with my son (also epic). Cambodia is one of the best destinations I have ever visited and if I could go back tomorrow, I would. 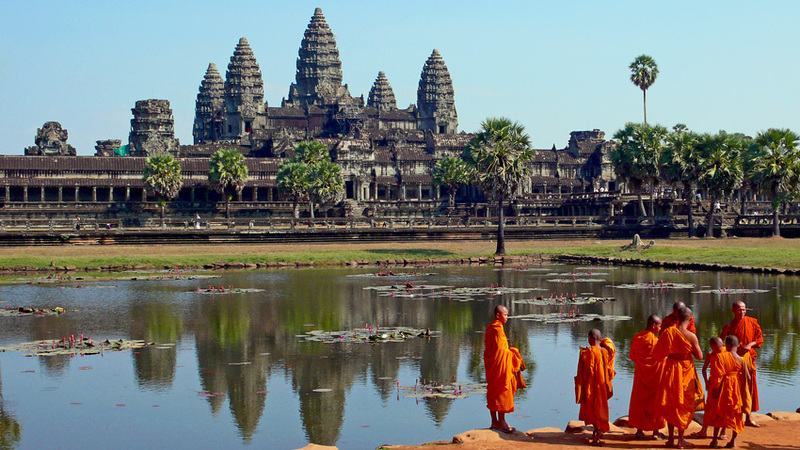 Today I’ll focus on Angkor Wat, the bucket list gem of Cambodia, and the surrounding area. In Part II, I will continue with our experiences in the capital city, Phnom Penh. Night one was a late arrival in capital city of Phnom Penh. We paid $28 for a room at You Eng Hotel near the airport. Enjoyed a perfectly nice, clean room within walking distance of everything one would need. The breakfast was superb and there was free Internet. Night two began with an afternoon arrival in Siem Reap, our base to explore Angkor Wat. We chose one of the Starwood properties located close to the entrance to Angkor Wat, which we able to visit that evening. Incredible service, great food and paid with points. Nights three and four we moved over to the Lotus Blanc Resort. Secured for best rate offer on a web special, we had superior service, a lovely room, beautiful grounds, great location, free Internet and an elaborate breakfast buffet included — excellent value. Night five we were back in Phnom Penh and stayed at an IHG property and used a free night certificate. We were upgraded to a suite and paid extra for the club lounge (which was an incredible value, as we were allowed to use it after check-out and while waiting to depart for our evening flight). I previously shared some tips on planning a trip to Angkor Wat because we learned a great deal as the trip unfolded. The Khmer temple offerings are vast and there are scores of sites far apart, so transportation between destinations is required. Fortunately there are several inexpensive means to navigate the area, including bicycle, motorbike, tuk tuk, electric car, driver with air-conditioned vehicle and tour bus. While I’m not able to share a lot of photos of our explorations with you here, Virtual Tourist does a good job of compiling visitor suggestions and tons of photos. One thing for sure, you can get burnt out on temple exploring. Take time out to see the Siem Reap and the surrounding area between viewing days. As spectacular as the temples of Angkor Wat are, there is much more to see in Northern Cambodia. We hired a driver for the day and explored the surrounding area of Siem Reap, including a monastery, another unrestored temple, a boat trip up the river to a large fresh water lake and a Vietnamese floating village. Seeing the stilted homes along the river with no sanitation and often filthy surroundings filled me with grattitude for my privileged circumstances and reminded me of the poor conditions in which much of the world lives. The Vietnamese floating village was incredible — children paddling infants around in hand-carved canoes, residents fishing with nets, and boats made into homes with nothing more than tarps and tin. Cambodia has their own currency but you don’t have to exchange money, as the U.S. dollar is accepted everywhere. You can also buy a lot for a dollar. If you don’t mind sharing space with other travelers, head to the night market for a dollar foot/body massage or a $3 pedicure/manicure (a free drink is included and it’s a perfect ending to a day spent exploring the ancient temples). There are plenty of street food options for a dollar or less; our favorite was sticky rice grilled in bamboo. A t-shirt will set you back about $2. Take an extra bag and do your Christmas shopping. Bargaining is easy and stress free; the people are very friendly and eager to please. Entertainment and transportation are also inexpensive. We purchased a ticket to a traditional dance show for $12 and it included dinner. You can get tuk tuk transport to anywhere in Siem Reap for as little as $2 — certainly never more than $5. How would I describe Cambodia? The words ancient, vibrant, evolving, cheap, friendly, delicious and totally thought-provoking come to mind. Stay tuned for Part II of our Cambodian experience as we move on to the capital city of Phnom Penh. If you wish to stay at one of the well-reputed hotels in Siem Reap like Lotus Blanc Resort, book direct with the hotel or via email info@lotusblancresort.com to get the best guaranteed rate. © 2014-2019 Lotus Blanc Resort.